Under-pressure manager Gary Rowett is confident Stoke City will still challenge for promotion after a battling draw with Rotherham but admits they are prone to panicking when they fall behind. The Potters trailed 2-0 early in the second half to a Ryan Manning penalty and Richie Towell's close-range finish. But Tom Ince swept in an Erik Pieters cross and substitute Bojan Krkic headed in a late leveller. Rowett told BBC Radio Derby: "How did we end up being 2-0 down after what I would say was as dominant an opening 45 minutes anywhere across the leagues? "What we are doing at the moment is having five minutes where we panic and we look a bit starry-eyed and then give them another chance from a set-piece. "The two goals came from moments where we were in control. It's little lapses of concentration. We actually defended very well for the majority of the game." Stoke, relegated from the top flight last season, were the pre-season favourites for the Championship title. The former Burton and Derby boss remained bullish despite his side lying 17th in the table, having only managed two wins from ten matches. "I genuinely believe we will finish in the top six if we can cut those mistakes out because we have so much quality," he added. "We are playing exciting football at times and creating opportunities. We are just marring it." An entertaining match at The New York Stadium saw the Potters dominate the first half without taking the lead. Benik Afobe had a header bounce clear off the Rotherham crossbar, and home goalkeeper Marek Rodak kept the Potters at bay with a string of smart saves. The Millers went from level at the break to seemingly in charge five minutes later as Manning converted a spot-kick awarded when Ryan Williams was adjudged to have been fouled by his namesake Ashley in the Stoke box. Their lead was doubled two minutes later as Towell poked in Richard Wood's towering header from an inswinging corner. But Stoke hung on and arguably finished the stronger of the two sides. After Ince's goal reduced the deficit, their persistence finally paid off. Joe Allen volleyed against the crossbar as Rowett's side pressed for a leveller and they were rewarded. 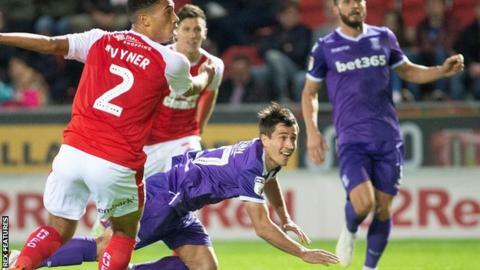 Rotherham protested when a throw-in was awarded when seemingly still in play, but Stoke played on and Bojan stooped to direct Afobe's dangerous cross beyond Rodak's reach. The draw lifts both sides up two places to 18th and 17th respectively. "I asked the lads afterwards what they thought and their overall feeling was disappointment, to be in a good position at 2-0 up and get a draw, they feel a little bit down about it, but I don't. "Even if we'd lost the game, I'd still have had an emotion of pride, they're doing everything they can for this great club. "First half, they controlled the game and I said to them at half-time 'you're better players than you think, so enjoy having the ball'. "We started the second half really well, got a couple of goals, maybe a bit too early, probably put a bee in the nest a bit too quick." Match ends, Rotherham United 2, Stoke City 2. Second Half ends, Rotherham United 2, Stoke City 2. Attempt missed. Bojan (Stoke City) right footed shot from outside the box is high and wide to the right. Assisted by Erik Pieters. Attempt blocked. Semi Ajayi (Rotherham United) header from the centre of the box is blocked. Assisted by Will Vaulks with a cross. Attempt missed. Michael Smith (Rotherham United) header from the centre of the box is close, but misses to the right. Assisted by Joe Mattock with a cross. Attempt missed. Peter Crouch (Stoke City) header from the centre of the box misses to the right. Assisted by Cuco Martina with a cross. Attempt blocked. Will Vaulks (Rotherham United) right footed shot from outside the box is blocked. Assisted by Ryan Williams. Goal! Rotherham United 2, Stoke City 2. Bojan (Stoke City) header from the centre of the box to the top left corner. Assisted by Benik Afobe with a cross. Hand ball by Ryan Manning (Rotherham United). Substitution, Stoke City. Charlie Adam replaces Joe Allen. Corner, Rotherham United. Conceded by Bruno Martins Indi. Corner, Rotherham United. Conceded by Bojan. Corner, Rotherham United. Conceded by Cuco Martina. Substitution, Rotherham United. Jon Taylor replaces Joe Newell. Attempt blocked. Erik Pieters (Stoke City) left footed shot from outside the box is blocked. Assisted by Tom Ince. Joe Allen (Stoke City) hits the bar with a right footed shot from the centre of the box. Attempt blocked. Saido Berahino (Stoke City) header from the centre of the box is blocked. Assisted by Cuco Martina with a cross. Attempt blocked. Billy Jones (Rotherham United) header from the centre of the box is blocked. Assisted by Joe Newell with a cross. Goal! Rotherham United 2, Stoke City 1. Tom Ince (Stoke City) left footed shot from the centre of the box to the bottom right corner. Assisted by Erik Pieters with a cross. Offside, Stoke City. Saido Berahino tries a through ball, but Benik Afobe is caught offside. Attempt saved. Saido Berahino (Stoke City) right footed shot from more than 35 yards is saved in the bottom left corner. Assisted by Erik Pieters. Substitution, Rotherham United. Zak Vyner replaces Richard Wood because of an injury. Offside, Rotherham United. Marek Rodák tries a through ball, but Michael Smith is caught offside.